The scale and the depth of Nazi brutality seem to defy understanding. What could drive people to fight, kill, and destroy with such ruthless ambition? Observers and historians have offered countless explanations since the 1930s. According to Johann Chapoutot, we need to understand better how the Nazis explained it themselves. We need a clearer view, in particular, of how they were steeped in and spread the idea that history gave them no choice: it was either kill or die. Chapoutot, one of France's leading historians, spent years immersing himself in the texts and images that reflected and shaped the mental world of Nazi ideologues, and that the Nazis disseminated to the German public. The party had no official ur-text of ideology, values, and history. But a clear narrative emerges from the myriad works of intellectuals, apparatchiks, journalists, and movie-makers that Chapoutot explores. The story went like this: In the ancient world, the Nordic-German race lived in harmony with the laws of nature. But since Late Antiquity, corrupt foreign norms and values--Jewish values in particular--had alienated Germany from itself and from all that was natural. The time had come, under the Nazis, to return to the fundamental law of blood. Germany must fight, conquer, and procreate, or perish. History did not concern itself with right and wrong, only brute necessity. 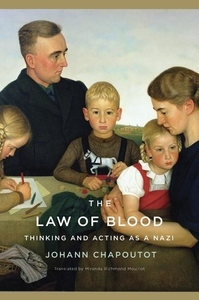 A remarkable work of scholarship and insight, The Law of Blood recreates the chilling ideas and outlook that would cost millions their lives.